Mount Carmel College of Nursing’s Adult-Gerontology Acute Care Nurse Practitioner (AG-ACNP) Certificate Program is designed for Master's prepared registered nurses who wish to pursue an acute care focused, advanced practice nursing role. The Adult-Gerontology Acute Care Nurse Practitioner provides health care services to adult patients with complex acute, critical and chronic health conditions in high acuity settings that require intensive monitoring and therapeutic intervention. These advanced professionals are typically employed in hospital settings, including intensive care, sub-acute care and emergency care but may also be employed in ambulatory, outpatient and rehabilitative settings to provide population-based care across the healthcare continuum for the purpose of restoring individuals to their maximal health potential, following an acute care episode. The program is offered in a hybrid model, with both online and face-to-face coursework. Post-Master’s Certificate Adult-Gerontology Acute Care Nurse Practitioner classes begin Summer Term. The certificate programs are approximately one to two years (minimum of 3 semesters) in length if program of studies are followed. The certificate program of study is dependent on the previous graduate course work and courses may be. However, all students must successfully complete specialty track coursework, achieve 650 clinical practicum hours and maintain a 3.0 GPA to earn a program certificate. Dependent upon Master's degree courses previously completed. For those students who already hold a national nurse practitioner certification and seek a second nurse practitioner area of focus, their transcripts will be evaluated for clinical practicum hours and courses. Our Master’s nurse practitioner programs require the attainment of 650 clinical practicum hours. It is possible that a certified nurse practitioner will be given transfer credit for 150 hours of our 650 clinical practicum hour requirement, because national AG-ACNP and FNP certification exams require a minimum of 500 clinical practicum hours. We want to acknowledge the clinical expertise already demonstrated by the certificate student. Furthermore, it is possible that an actively practicing nurse practitioner with a certificate to prescribe seeking a second nurse practitioner certification, will be given transfer credit for NURS 579: Transition to Advanced Practice because this course discusses the legal implications of advanced practice and the responsibly of prescription authority, that already have actively practiced. Mount Carmel College of Nursing’s Family Nurse Practitioner (FNP) Certificate Program is designed for Master's prepared registered nurses who wish to pursue a primary care focused, advanced practice nursing role. The Family Nurse Practitioner provides comprehensive primary healthcare to individuals from infancy to adulthood. FNPs are prepared to provide care to individuals with acute illnesses such as bronchitis or minor infections and chronic illnesses such as diabetes, high blood pressure and obesity. Preventative health services, patient education, disease management and other health initiatives are provided to heal the body, mind and spirit within the context of family and community. The program is offered in a hybrid format with online and face-to-face coursework. Post-Master’s Certificate Family Nurse Practitioner classes begin Summer Term. The certificate programs are approximately one to two years (minimum 3 semesters) in length if program of studies are followed. The certificate program of study is dependent on the previous graduate course work and courses may be waived or additional courses required. However, all students must successfully complete specialty track coursework, achieve 650 clinical practicum hours and maintain a 3.0 GPA to earn a program certificate. 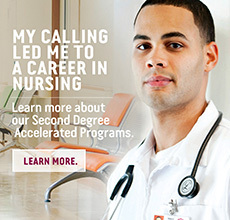 Mount Carmel College of Nursing’s Nursing Education Certificate Program, offered online, prepares the Master's prepared registered nurse to enter the academic classroom and institutional staff development department as faculty to educate the next generation of nurses or to take on staff development responsibilities in a healthcare setting. This advanced professional will apply relevant research in nursing education and understand the ethical and legal issues associated with the role of an educator in nursing. The program will conclude with a practicum learning experience. The certificate programs are approximately one to two years (minimum of 3 semesters) in length if program of studies are followed. The certificate program of study is dependent on the previous graduate course work and courses may be waived or additional courses required. However, all students must successfully complete specialty track coursework, achieve 150 educational practicum hours, 50 clinical practicum hours and maintain a 3.0 GPA to earn a program certificate. Mount Carmel College of Nursing’s Master of Science Certificate Program in Nursing Administration is designed for career-minded, Master's prepared registered nurses who are ready to assume even greater responsibility and reap the benefits of expanded career opportunities. This advanced professional will apply knowledge and skills to provide vision and leadership within an ethical framework in healthcare environments. This program is offered in a hybrid model with both online and face-to-face coursework. An administrative internship serves as the capstone of this program. Our nursing administration track is designed for the professional nurse who is ready to advance their career by assuming managerial and administrative roles. The certificate programs are approximately three years (minimum of 5 semesters) in length if program of studies are followed. The certificate program of study is dependent on the previous graduate course work and courses may be waived or additional courses required. However, all students must successfully complete specialty track coursework, achieve 150 educational practicum hours and maintain a 3.0 GPA to earn a program certificate. Mount Carmel College of Nursing’s Accelerated Online Adult-Gerontology Acute Care Nurse Practitioner (AG-ACNP) Certificate Program is designed for Master's prepared registered nurses who wish to pursue an acute care focused, advanced practice nursing role. The Adult-Gerontology Acute Care Nurse Practitioner provides health care services to adult patients with complex acute, critical and chronic health conditions in high acuity settings that require intensive monitoring and therapeutic intervention. Accelerated Online Post-Master’s Certificate Adult-Gerontology Acute Care Nurse Practitioner classes begin Fall semester. Note: MCCN distance education program cannot currently admit students from the state of Colorado. The baccalaureate, master’s and Doctor of Nursing Practice programs at Mount Carmel College of Nursing are accredited by the Commission on Collegiate Nursing Education, One Dupont Circle, NW, Suite 530, Washington DC 20036, (202) 887-6791.